Dana Dolly Portable Pipe kit. Six 39" lengths of schedule 80 aluminum pipe, machined and threaded at the ends. Pipe may have normal pipe blemishes and scratches that do not effect performance. 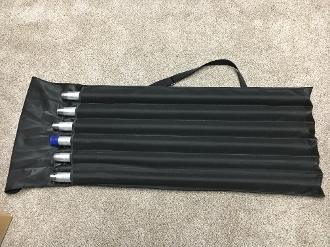 Carry bag has sleeves for pipe, carry handle and removeable strap. Everything made in USA.